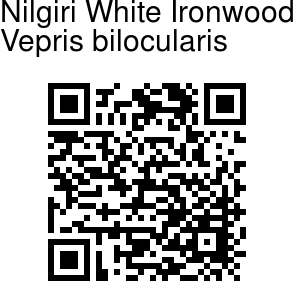 Nilgiri White Ironwood is an evergreen tree, up to 25 m tall, bark 4-6 mm thick, surface yellowish-grey, brittle; blaze dull yellow. Leaves are trifoliate, alternate, axis 2-10 cm long, slender, swollen at base, grooved above, hairless, blade 7-25 x 3-10 cm, elliptic, oblong, elliptic-inverted-lanceshaped, elliptic-oblong or elliptic-obovate, base pointed, wedge-shaped or rarely oblique, tip tapering, margin entire, curled, hairless, pellucid-gland dotted, leathery; lateral nerves parallel, close. 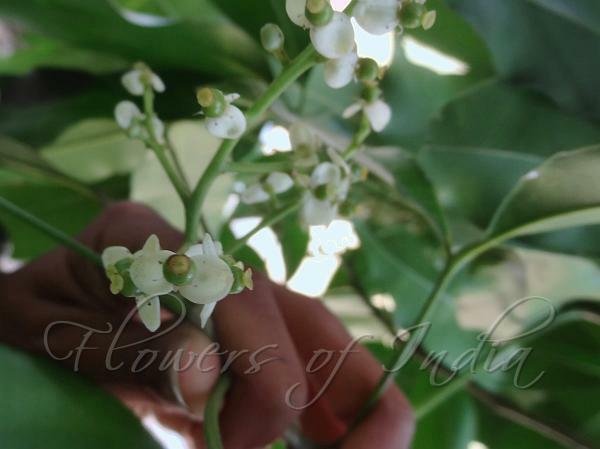 Flowers are unisexual, 5-6 mm across, yellow, in panicles in leaf-axils and at branch-end. Male flowers have calyx small, saucer-shaped, 2-3 lobed; petals 2-4, free, round, glandular, hairless, overlapping; stamens 6, inserted under the disc, protruding, equal. Female flowers have sepals and petals as in male flowers; staminodes rudimentary; ovary superior, spherical, 2-4-celled, stigma capitate. Fruit is a berry, spherical, 2-celled, fleshy, glandular; seeds 2, planoconvex, brownish. Nilgiri White Ironwood is endemic to southern Western Ghats- South and Central Sahyadris. Flowering: February-April.